It is a rare opportunity to hear John Cage’s groundbreaking solo prepared piano work, the Sonatas and Interludes, performed live. Lasting just over an hour, there are dozens of screws, bolts, pieces of rubber, coins, strips of plastic, that are inserted into the strings of the piano to create breathtakingly beautiful sounds that are reminiscent of percussion instruments from around the world. 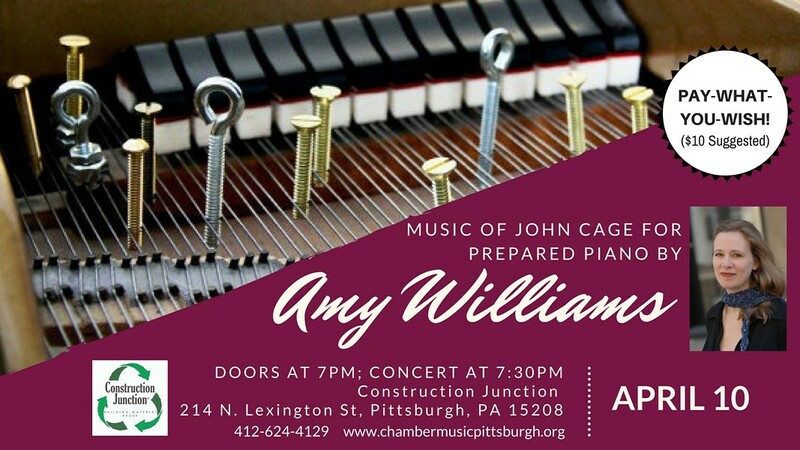 Chamber Music Pittsburgh invites you to hear Amy Williams perform surrounded by potential musical instruments (aka “junk”) at Construction Junction to further intensify the experience.